Hi! My name is Victoria Heifner, and I’m a designer and letterpress printer here in the San Francisco Bay Area. I’m thrilled to share the story of my handmade map-making process with you in the digital GIS community. I’ve been creating social stationery, invitations, business cards, and custom maps for about 15 years now, and my business is called Milkfed Press. I began this journey while learning how to hand-set moveable lead and wood type in Berkeley, California. I was working as a book repairer at the San Francisco Public Library, so would spend hours upon hours poring over book titles, vintage maps, and what I love to generally classify as ephemera (tickets, book plates, etc.). At this point, I had mastered the art of making a book, taking a book apart and putting it back together, and now I wanted to learn how to print what’s inside the book. I found a wonderful printer in Berkeley, California who allowed me to come to his shop regularly and distribute type, learn how to operate the printing presses, and eventually start creating my own designs. I had no background in graphic design nor did I even know how to turn on a computer. I think this hands-on experience was a pivotal point for me in my learning process. I started with raw materials—type, ornaments, ink, and paper, and by the end of the day I would have completed something in-hand. It wasn’t long before I started making wedding invitations, and the more fun the clients, the more fun the scope of my projects. One client in particular was having a destination wedding in Yosemite; people were coming from all over the country to share their big day with them. 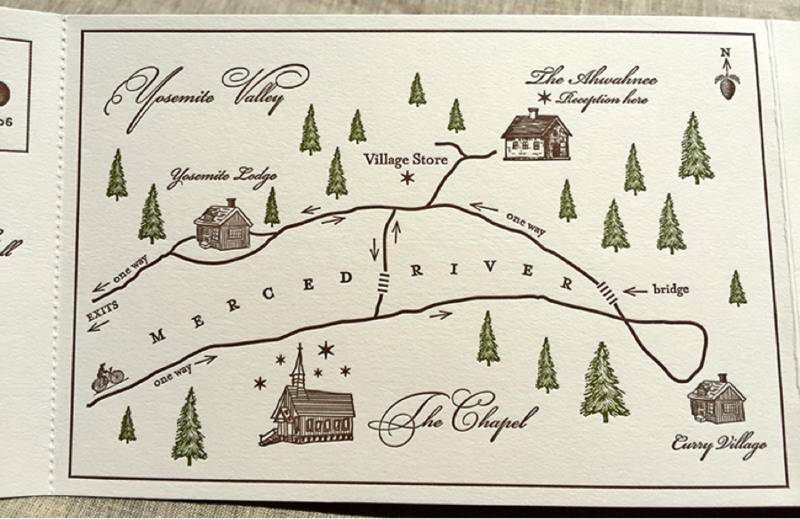 Both lovers of a more vintage-style of designs, we created a very simple map to get their guests excited. It was a huge hit! While this map had generalized directions with simple graphic cues, it occurred to me that sending a map really was a great way to inspire the guests for the event. I was hooked on making more. One important thing to mention—this was before navigation systems were available in every car, so it turned out that having a printed map for visual cues was helpful for those driving to the event. I started offering maps as part of an invitation suite package, particularly for couples that were having a full weekend of events, destination weddings, or those who just wanted to make it fun. This became really educational for me, as many of these places I had never heard of, nor been to. These maps were a new concept at the time, and they really started to take off. One of my earlier maps was even featured in an issue of Martha Stewart Weddings. Obviously, there are many different ways to approach making a map. I like to strike a balance between the left-brained types (where “turn left at the oak tree” makes sense to them) and the right-brain types (“head East when you come to Oak Street”). Putting things like altitude (for example, on my map of Deer Valley in Park City, Utah) are important, so people can get the cue that more water, less bubbly might be helpful, without printing it all out. This approach really depends on my clients, as they know their people best. In either direction, I’ll start with a conversation and many questions—where will the event take place, is there a full weekend planned, and what are some of the highlights of the area that are important for the couple to share? It can be an iconic building, an event like a farmer’s market, a childhood home, and so forth. If it’s a full weekend schedule I might use the map to convey times and addresses of places. It makes the whole experience more personal, and really sets the tone for a fun weekend. Once I’ve established the important elements, I get to work. Depending on the area, I’ll approach it with different sources for reference. Sometimes I’ll go to my local library to learn more about an area, sometimes I’ll request a simple stick-figure drawing from the couple so I can get a sense of the layout, and many times I’ll access information from the Internet. If I’m creating a map, I’ll lay out the route as if I were driving it myself. I like to imagine I am there and consider the questions I’d ask myself. How far away is it from the airport? Will people be driving themselves to the reception from the ceremony? Creating these maps walks a fine line between whimsy and somewhat technical. I’ve found that which direction I lean on really depends on the event itself, as well as the couple. When I get a sense of the layout and the particulars, I’ll get to work in my sketchbook. If there’s an iconic building that needs to be included, I’ll look it up on the Internet and pull up a picture (if available) for reference. Creating maps does take a deceptively long time, but it’s usually pretty rewarding. I like to imagine that one day I, too, will travel to most of these places, and I’ll definitely have a sense of the place. After I’ve put together a rudimentary sketch, I’ll scan it into my computer, and send it to my clients to check for accuracy and make sure there isn’t anything else they’d like to add. If all is a go, I’ll do my fine-tuning, adding arrows, highways, street names, events times, and dates—this is the really fun part for me. One thing I’ve noticed, and really appreciate, is that on one hand, the invitations tell people the basic information: who is getting married, when, and where. It’s pretty straightforward. Creating the maps though? It really gets my clients thinking about and envisioning their day in a way that is unlike creating the invitations. They picture the place they’ll all be gathering, the town, what the area has to offer, and why it is so special to them. They seem to inhabit the event in a way that’s truly more involved. I really love this process, and I think that for them, it makes the whole experience so much more fulfilling. After I’ve received approval, I’ll go to work creating the printing plates. I’ll clean up any line-work or add to it if I must (line-art prints best, but too-fine of a line will break down in the plate making process, or even worse—break on the press). With letterpress printing, you cannot simply hit “print.” Each color requires its own plate, and therefore its own press run. If I am creating something in two colors, I’ll need to separate the two colors from each other, and make two plates. I prepare my files digitally, and send them out to have a film negative made. Once I receive this, I can make my plates from that. This whole process is a somewhat new (last 20 years) component to printmaking, and I attribute it to pretty much saving the craft of letterpress printing from total extinction. Being able to print my illustrations and a variety of typefaces, hand-lettering, and artwork from plates has been invaluable to my business. After I have my plates, I can go to press! I have magnetic bases specially made, and I put the steel-backed plates right on them. Once I get them positioned just so, I use a hand-cranked press to print them up. This is the muscles-portion of my job. If I’m printing an edition of 100, but say it’s two-colors? I will print that piece of paper 200 times, and so on. I really like this part of the process. I am one of the rare few who can both design and print (most do one or the other). I definitely use two parts of my brain when creating my work—the first portion is dedicated to design of the piece, and the second is dedicated to the printing of the piece. I’m fortunate in that as a designer, I can think like a printer, and as a printer, I can easily know what the designer (me) had in mind while executing the job. I find the whole experience satisfying, and feel like my maps really make the package come together. Thank you for allowing me to share my process with you! If you’re curious about my work, or think you may have a map that you’d like me to create, please find me at http://www.milkfedpress.com.